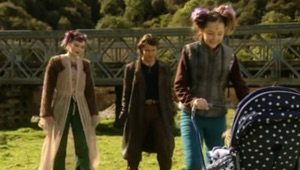 Patsy is first seen in series one episode one, when Cloe leads Amber and Dal to the playground, where Patsy is playing with her deaf brother Paul. At the Mall, Paul disappears after a while, leaving Patsy to blame Lex for Pauls' disappeance. Patsy becomes best friends with Cloe and they play games together. She also finds a friend in KC when he arrives at the Mall. Patsy has a love for animals and between Cloe, Paul and Salene they look after Bob the dog. The Mall Rats acquire some chickens that Pasty takes care of. Near the end of series one Patsy made sure all the animals came on the trip to Eagle Mountain. In series two Bob passes away after being poisoned, leaving Cloe and Patsy upset. During Patsy's grieving time, she blames Danni, for Bob's death. She moves on going out and exploring the streets with Cloe. They find a dog and name it Cloudy. Patsy and Cloe, soon have a falling out, over boys, and compete over Dal. Patsy then takes on the job of babysitting young Brady. She takes her eyes off Brady for a second to returns to find her missing. Trudy becomes angry at Patsy, who cannot help, but blame herself for young Brady's disappearance. Trudy uses Patsy, who begins to do anything Trudy wants her too. At the end of series two Trudy sends Patsy on a mission to get Ebony to come to the docks. Ebony realizes it's a trap, and the black van is about to take Ebony's life when she falls over into the water and disappears. Patsy sees this and starts to have nightmares about Ebony. She asks, Cloe, if she can sleep with her, but Cloe tells her to go to Trudy. Patsy stays up all night unable to sleep, sitting in the cafeteria, to discover Ebony is well and truly alive. After a chat with Ebony, Cloe and Patsy start talking again. Trudy discovers they are friends again, and becomes angry when Patsy runs off with Cloe. Cloe and Patsy warn the other Mall Rats that the Chosen are after all the tribe leaders. In series three Patsy joins the Chosen, so she can help Alice and Ellie, spy on the Chosen and learn their plans. Patsy is soon caught out by the Chosen, and taken to the mines. Patsy is never seen again. Patsy's style starts out simple, a red long sleeved top and a darker red flared skirt which sits above knee level. This is covered by a brown mesh dress, which is longer than the skirt, falling below her knees. Throughout season one Patsy's skirt and overdress remain the same style, although the under top becomes brighter. She also wears brown cowboy boots. Her tribal markings vary, changing throughout the series. The styles used include: a green zigzag on her right cheek, a green spot on her chin and a green Chinese symbol on her forehead. Throughout seasons two and three Patsy experiments with her clothes and hairstyles to try and appear more mature. She dyes her hair from brown, to brown with blond bangs, she then adds blond highlights, by season three Patsy has brown hair with a blonde fringe. Her outfits range from a blue velvet top with an orange skirt, to a camouflage top and trousers. When she is accepted into the Chosen she adopts the yellow robes of an acolyte.